Eccentric footing consists of two isolated footings connected with a structural strap or a lever. The strap connects the footing such that they behave as one unit. The strap simply acts as a connecting beam. An eccentric footing is more economical than a combined footing when the allowable soil pressure is relatively high and distance between the columns is large. 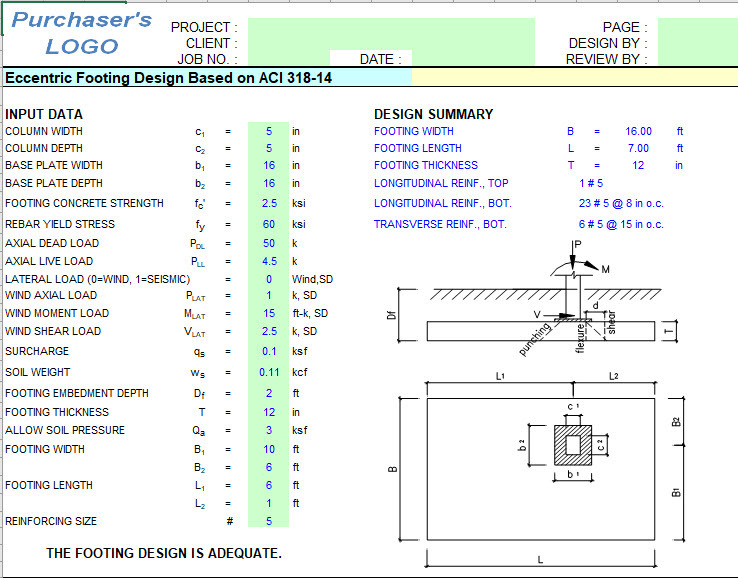 A spread or wall footing that also must resist a moment in addition to the axial column load. Normally, the footing are so designed and proportioned thatthe C.G. of the superimposed load coincides with the C.G. of the base area, so that the footing is subjected to concentric loading, resulting in uniform bearing pressure. However, in some cases, it may not be possible to do so, for example, if the wall (or column) under construction is near some other property, it will not be possible to spread the footing to both the sides of the wall or column.